When it comes to kids' mood, energy, focus and success at school, one of the most influential factors is diet. And a hugely important part of what kids and teenagers eat and drink every day happens between meals: mid-morning, after school, when they finish a sports game, at the beach. A smart snack will boost them with nutrients and slow-release energy, whereas a processed snack or soft drink can cause a spike in their blood sugar, throwing out their mood and concentration. Poor snack choices can also have longer-term effects on their physical and mental wellbeing. I have been a child and adolescent psychologist for more than three decades and there is no doubt that things are not going swimmingly in terms of young people’s mental health. The statistics reveal an epidemic of eating disorders, depression, anxiety, self-harm and suicidal ideation which is compromising the health and wellbeing of this generation. Childhood and adolescence are periods of swift development that are vitally important to developing a sound underpinning for good physical and psychological health later in life. Sadly, almost all the research demonstrates that members of the population I care about most are failing to meet many of the professional recommendations, especially when we examine their diet. Visually spectacular and perfect for warmer days. Smart Snacks author Flip Shelton shares her top-ten snacking tips. 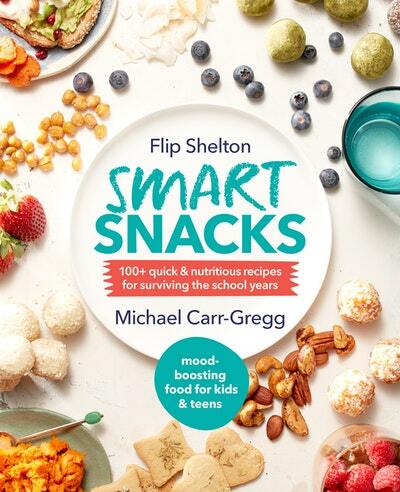 Love Smart Snacks? Subscribe to Read More to find out about similar books.